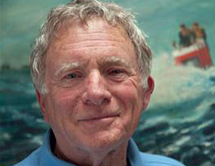 Dr. Walsh is an oceanographer, explorer and retired Navy captain whose career was in submarines. In 1960, Walsh and Jacques Piccard dove to the oceans’ deepest place in the Navy’s Bathyscaph Trieste. For the past 50 years he has remained active in undersea science, technology, and operations. His contributions were recognized in 2001 when he was elected to the National Academy of Engineering. In addition to his undersea work he has also participated in over 57 expeditions to the Arctic and Antarctic. The “Walsh Spur” in the Antarctic is named in his honor. Since 1976, he has been head of an ocean-oriented consulting practice, International Maritime, Inc. Most recently helped advise movie director James Cameron on his historic dive to the deepest place on Earth – the Mariana Trench in the Pacific Ocean- becoming the third person to ever reach this spot.